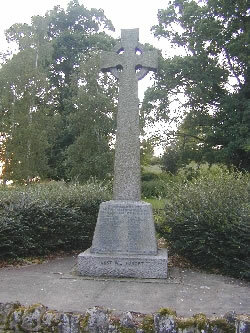 The Great Bealings War Memorial opposite the church, at the junction of Hall Farm Road and Hasketon Road, lists members of the village community who fell in the Great War, and in the Second World War. For those interested in tracing relations, please visit the page where Phil Holmes has listed everyone who lived in Great Bealings who is recorded in currently available census records.. The memorial is maintained by the Parish Council on behalf of the village, and the committee members each take turns in maintaining and clearing the area around the memorial. 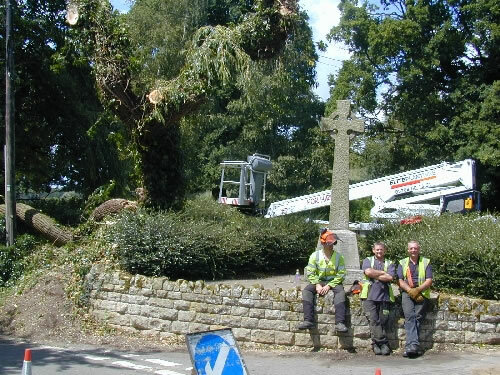 On 20th June 2007, it had a lucky escape when a large branch of the elderly willow tree adjoining the memorial, broke off during a thunderstorm and landed right on top of it. Luckily, nothing was broken, and the picture shows the clearance crew from Elite, having just finished tidying up and carting away the remains of the severely lopped willow to the left.